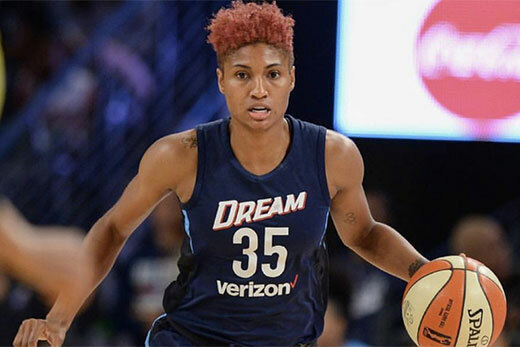 As Emory hosts GirlCon to celebrate National Girls & Women in Sports Day, the Atlanta Dream's Angel McCoughtry will sign autographs between Friday's women's and men's basketball games. The Emory women's basketball program in conjunction with the Center For Women at Emory University will host GirlCon this Friday, Jan. 25, to celebrate the 33rd Annual National Girls & Women in Sports Day. The Eagles of head coach Misha Jackson will battle Brandeis University starting at 6:00 p.m. at the Woodruff PE Center on the Emory campus. The highlight of the festivities will be an appearance by the Atlanta Dream’s Angel McCoughtry. McCoughtry will speak to a group of young people attending the game and take part in an autograph session between the women’s and men’s games. During her nine-year career with the Dream, McCoughtry has averaged 19.2 points and 5.0 rebounds per game. The WNBA’s leading scorer on two occasions, she has competed in five All-Star Games and been tabbed to the league’s All-Defensive First Team on seven occasions. She has distinguished herself in the postseason as well, averaging a little more than 22 points in 33 playoff contests. For more than three decades, NGWSD has empowered women and girls to get moving, reap the benefits of physical activity and extend past their limits both in sports and in life. The confidence, strength and character gained through sports and physical activity are the very tools needed to become strong leaders in life and in the world. It also serves as a catalyst to acknowledge the accomplishments of female athletes and honor the progress and continuing struggle for equality for women in sports. This year, Emory hopes to honor the many ways that sports push girls and women to achieve excellence and realize their boundless potential.